UN International Court of Justice Ruling…will it make a difference? You are here: Home / Commercial Whaling / UN International Court of Justice Ruling…will it make a difference? Yesterday the UN International Court of Justice ruled on a court case brought by Australia against Japan in 2010, citing that Japan’s so called “scientific whaling” was commercial whaling by another name. 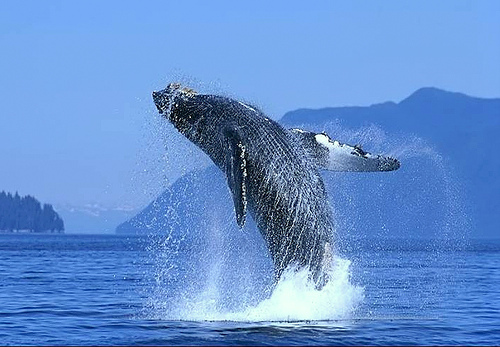 The ruling has found in favour of Australia and considers that Japan’s insistence that their self imposed quotas of over 1000 whales to include the still endangered and threatened fin and humpback whales, was not justified under the caveat of “scientific whaling”. A loophole granted by the International Whaling Commission (IWC) at the time the world wide moratorium on commercial whaling was set up in the mid 1980’s. “…The UN’s International Court of Justice (ICJ) has ruled that the Japanese government must halt its whaling programme in the Antarctic. It agreed with Australia, which brought the case in May 2010, that the programme was not for scientific research as claimed by Tokyo. Japan said it would abide by the decision but added it “regrets and is deeply disappointed by the decision”. 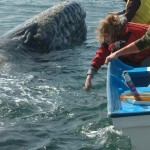 Australia argued that the programme was commercial whaling in disguise. The court’s decision is considered legally binding. Is this a time for rejoicing or quiet reflection? But beware of complacency. Japan still kills many hundreds of whales in their North Pacific “fishery” and the appalling abuses and cruelty of the dolphin and porpoise drive hunts of Taiji and elsewhere along the Japanese coast, show no signs of abating. Mark my words Japan is still very much committed to killing both small and large cetaceans in their thousands and may well increase self allocated quotas elsewhere to make up for any shortfall as a result of losing the Antarctic kill quotas. > Will the current fiercely anti-environment Australian government relax pressure on Japan in some way as a sop to this ruling? > Will Japan honor their commitment to abide by the ruling? Many believe that their commercial whaling operations in the Southern Ocean Whale Sanctuary were simply for political reasons to ensure their freedom on the high seas and to distract world attention to the damage their fishing fleets are doing in the Pacific. > Will this harden the attitudes of the Japanese Government when it comes to dolphin drive hunts and other whaling activities? > Will this increase the market in Japan for Icelandic whale meat? There is, as we speak, a ship, The Alma, heading down the West Coast of Africa that departed Iceland some days ago, laden with 2000 tonnes of frozen whale meat…widely presumed to be bound for the Japanese market. > With declining taste for whale meat in Japan will those with vested interests now develop the luxury doggy treat market using whale meat? It is claimed that there are warehouses in Japan full to overflowing with frozen whale meat that was originally bound for the table. With declining demand will this now end up being fed to dogs? These are just some of the questions. There are many more…but the 94 million dollar question is…will this ruling make a difference? You are damn right it will make a difference! It sets a precedent and gives the thousands of conservationists around the globe hope that “the establishment” will one day step up to the mark and take marine environmental protection seriously. 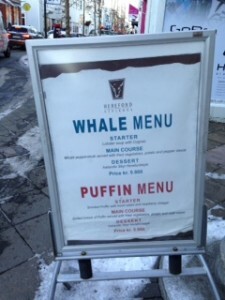 During the last two years there has been a huge increase in the “normalisation” of eating whale meat. Tourists now flock to Iceland and Greenland to watch these enigmatic denizens of the deep only to return to eat whale meat washed down with fine claret in the many restaurants that now specialize in eating cetaceans. Shipments of whale meat have crossed Canada and EU nations en route to Japan…a nation whose residents it is said don’t want to eat it! So did the UN International Court of Justice have a choice in the matter? I suspect not. They could not in all realism come to any other decision as Japan’s abuse of the commercial whaling moratorium in the Southern Ocean Whaling Sanctuary were palpable. A huge floating factory ship supported by three killer boats, freezing down the whale meat to be sold on the open market back in Japan. This for the scientific study of whales? No, the honourable judges who came to this conclusion had no other route but to find in favour of Australia…and Japan have known that all along and been preparing for this eventuality I feel sure. But to take four years to make that ruling while pulling down hefty salaries beggars belief! We must see the ruling for what it is. Simply that…the Japanese overt commercial whaling operations in the Southern Ocean Whale Sanctuary were not justified under the caveat of “scientific whaling”. Japan have been requested to stop that operation and Japan have said they will comply with that request. This is not an end to commercial whaling. Norway, Greenland and Iceland still send their boats out to catch whales for commercial exploitation. The Faroe Island still slaughters huge numbers of long finned pilot whales and Atlantic white sided dolphins in the name of cultural tradition…and Denmark supports them! The Solomon Islands have dolphin drive hunts that kill hundreds of animals annually.